Singapore is part of the East Asian-Australasian flyway, a migratory route used by birds flying south for the winter. 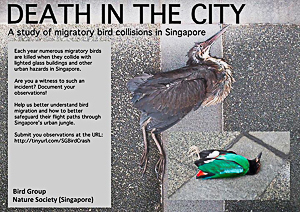 Each year numerous migratory birds are killed when they collide into lighted glass buildings and other urban hazards in Singapore. NSS Bird Group is conducting a study to help us improve our understanding of bird migration and how to better safeguard their flight paths through Singapore.